Explore Philadelphia on this hop-on hop-off tour! Visit 27 top Philadelphia attractions including the Liberty Bell, Independence Hall and the Betsy Ross House while touring the city in a fun, fast and scenic way. Enjoy a ride on an open-top, double-decker bus, with live commentary from your friendly and experienced guide. Select a 1, 2 or 3-day Pass for additional flexibility during your stay in Philadelphia. 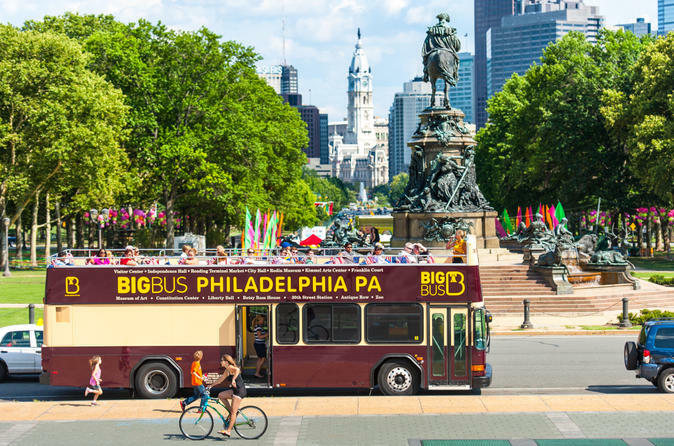 Hop on the open-top, modern double-decker bus at any of the 27 stops around Philadelphia to begin your hop-on hop-off sightseeing tour. With your ticket and provided map, you’ll ride a 1.5-hour loop that stops at top Philadelphia attractions, as well as restaurants and shopping and entertainment centers. Visit the Liberty Bell, Elfreth's Alley, Independence Hall, City Hall and the Betsy Ross House. Explore Chinatown, tour the Rodin Museum or the Independence Seaport Museum, stroll down Antique Row, explore the Philadelphia Zoo, and shop on South Street. Along the way, enjoy live narration from your onboard guide, who’ll share stories and facts about everything from the signing of the Declaration of Independence to the iconic Philly cheese steak sandwich – a must-try during your stay in Philadelphia!